Instead of having multiple block types with different textures and lighting conditions, we’ll suppose that our world is just a binary 0-1 voxel map. Similarly we won’t make any assumptions about the position of the camera, nor will we consider any level of detail type optimizations. Finally, we shall suppose that our chunks are stored naively in a flat bitmap (array). In a typical Minecraft game chunks do not get modified that often compared to how frequently they are drawn. As a result, it is quite sensible to cache the results from a mesher and only ever call it when the geometry changes. Thus, over the lifetime of a mesh, the total amount of computational work it consumes is asymptotically dominated by the cost of rendering. Criteria 1: Smaller meshes are better meshes. Criteria 2: The latency of meshing cannot be too high. Intuitively, it seems like there should be some tradeoff here. One could imagine a super-mesher that does a big brute force search for the best mesh compared to a faster, but dumber method that generates a suboptimal mesh. Supposing that we were given two such algorithms, it is not a-priori clear which method we should prefer. Over the long term, maybe we would end up getting a better FPS with the sophisticated method, while in the short term the dumb algorithm might be more responsive (but we’d pay for it down the road). Fortunately, there is a simple solution to this impasse. If we have a fast, but dumb, mesher; we can just run that on any meshes that have changed recently, and mark the geometry that changed for remeshing later on. Then, when we have some idle cycles (or alternatively in another thread) we can run the better mesher on them at some later point. Once the high quality mesh is built, the low quality mesh can then be replaced. In this way, one could conceivably achieve the best of both worlds. The time complexity of this method is linear in the number of voxels. Similarly, the number of quads used is 6 * number of filled voxels. For example, in this case the number of quads in the mesh is 8*8*8*6 = 3072. Clearly this is pretty terrible, and not something you would ever want to do. In a moment, we’ll see several easy ways to improve on this, though it is perhaps worth noting that for suitably small geometries it can actually be workable. The only thing good about this approach is that it is almost impossible to screw up. For example, I was able to code it up correctly in minutes and it worked the first time (compared to the culling method which took me a few iterations to get the edge cases right.) Even if you don’t plan on using this approach it can still be handy to have it around as a reference implementation for debugging other algorithms. Practically speaking, this method is pretty much the same as the previous, except we have to do a bit of extra book keeping when we traverse the volume. The reason for this is that now we not only have to read each voxel, but we we also have to scan through their neighbors. This requires a little more thought when coding, but time complexity-wise the cost of generating this mesh is asymptotically the same as before. The real improvement comes in the reduction of quads. Unlike the stupid method, which generates a number of quads proportional to the boundary, culling produces quads proportional to the surface area. In this case, the total number of faces generated is 8*8*6 = 384 — a factor of 8x better! It is not hard to see that the culled mesh is strictly smaller than the stupid mesh (and often by quite a lot!). We can try to estimate how much smaller using a dimensional analysis argument: assuming that our geometry is more-or-less spherical, let be its radius. Then, in the stupid method we would expect to generate about quads, while in the culled version we’d get only . This gives an improvement of a factor of about , which is pretty good! So, if our chunks were say 16x16x16, then we might expect the culled volume to have about 16x fewer faces than the naive method (heuristically). Of course, spherical geometry is in some sense the best possible case. If your world is really jagged and has lots of holes, you wouldn’t expect much improvement at all. 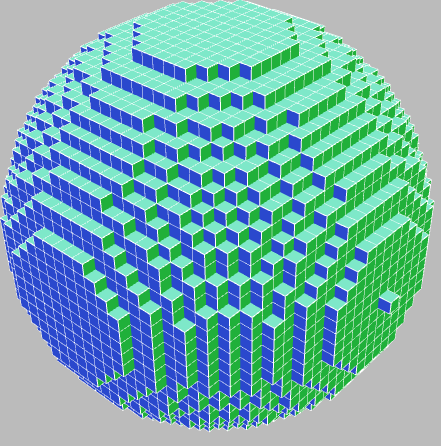 In the worst case (namely a checkerboard world) the size of the meshes produced would be identical! In practice, one would usually expect something somewhere in between. This reduces the 3D problem to 2D. The next step (and the hard one!) is to figure out how to mesh each of these 2D slices. Doing this optimally (that is with the fewest quads) is quite hard. So instead, let’s reformulate the problem as a different type of optimization. The idea is that we are going to define some type of total order on the set of all possible quadrangulations, and then pick the minimal element of this set as our mesh. To do this, we will first define an order on each quad, which we will then extend to an order on the set of all meshes. One simple way to order two quads is to sort them top-to-bottom, left-to-right and then compare by their length. Exercise: Check that this is in fact a total order. 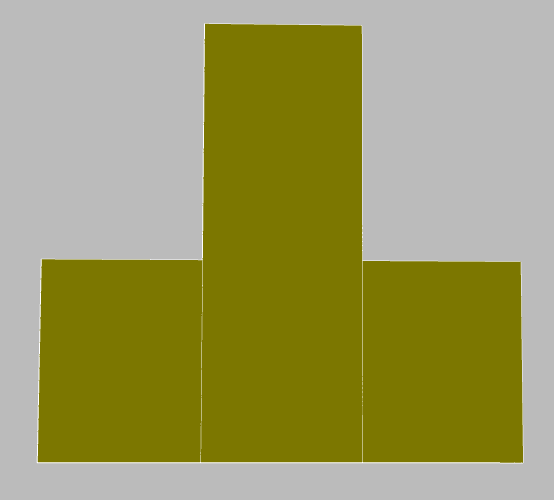 Exercise 2: Find a mesh of this shape which uses fewer quads. Proposition: The number of quads in the greedy mesh is strictly less than the number of edges in the perimter of the region. Theorem: The greedy mesh has no more than 8x as many quads than the optimal mesh. Proposition: For any simply connected region with convex and concave vertices on the perimeter, . 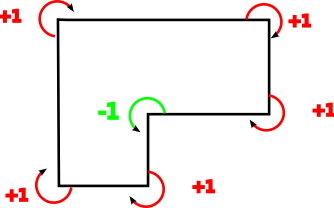 Lemma: Any connected genus region with a perimeter of edges requires at least quads to mesh. Proof: Let denote the number of convex/concave vertices on the perimeter respectively. Because each quad can cover at most 4 convex vertices, the number of quads, , in the mesh is always at least . By the winding number theorem, it is true that for simply connected regions , and so . Therefore any mesh of a simply connected region requires at least quads. To extend this to non-simply connected regions, we observe that any quad mesh can be cut into a simply connected one by slicing along some edges in the quad mesh connecting out to the boundary. 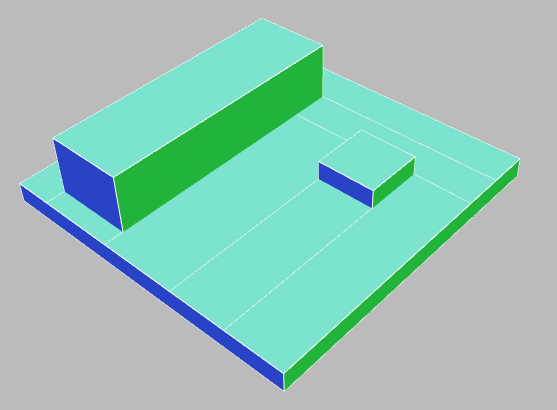 Making this cut requires introducing at most two edges per each hole in the object, and so we could just as well treat this as a simply connected region having edges, and applying the previous result gives us the bound in the lemma. As you can see, greedy meshing strictly outperforms naive meshing despite taking asymptotically the same amount of time. However, the performance gets worse as the curvature and number of components of the data increase. This is because the number of edges in each slice increases. In the extreme case, for a collection of disconnected singleton cubes, they are identical (and optimal). Conjecture: The size of the greedy mesh is at most . Open Problem: Do there exist efficient data structures for dynamically maintaining greedy meshes? If you have other questions or comments, please post a response or send me an email! I suspect, though, that every time you subtract the next greedy quad from the current figure, you reduce (horizontal edges) + (total genus) – (connected components) by at least 1. Hi Matt! Thanks for the reply! It’s still neat to note though that this hits the extreme bound for the conjecture of having exactly E/2 quad. If it had just one more quad it would be a valid counter example. With 10 quads and 16 edges, this would go beyond the bound of E/2. Ah, I think I see it. I think you’re using the sort-of-lexicographic ordering over (y,x,w,h), instead of over (x,y,w,h). If that’s true, a different counterexample works: in your first rotation, above, remove the block under the top-left corner. Sounds like you’re only considering non-overlapping quads. There are certainly situations where overlapping quads can reduce your quad count (eg the X pentomino). Is this because it makes the problem more complicated, or because there are other problems with overlapping quads? 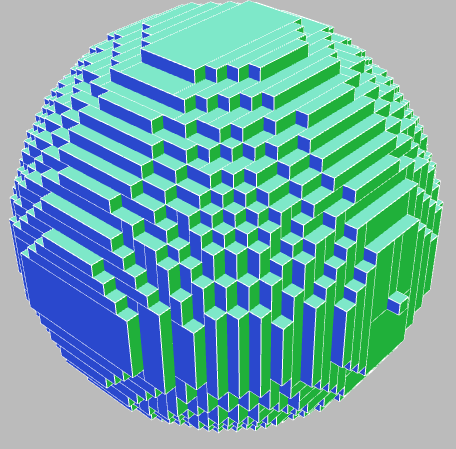 I’d be interested in how to implement the greedy meshing with different types of voxels. For instance, red, green and blue voxels, or multiple voxel textures. I had an implementation, but it took a lot of time and processing power compared to yours. By the way, I’ve modded Minecraft to see in a wireframe view with OpenGL, and they don’t use greedy meshing; only naïve culling. However, I suspect this could have some efficiency boost over greedy meshing for world modification, in that they don’t remesh the whole chunk for each block modification (maybe they do, but I can’t confirm). 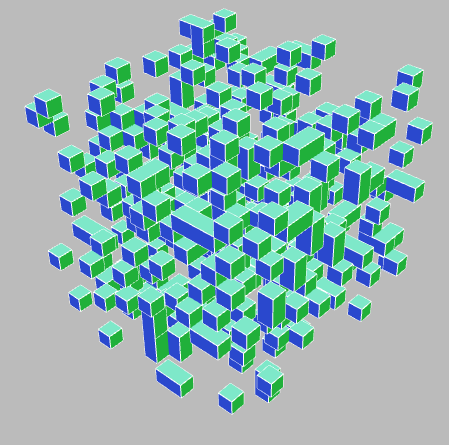 Say you break a voxel: an efficient way to handle the change would be to remove the vertices and indices associated with that voxel and add vertices and indices associated with the neighbouring voxels. Your implementations do not consider clockwise or counter-clockwise culling for the faces, which is needed for any practical use. Also, the greedy mesh seems to fail in some cases in the noise example. What I am more concerned about is the possibility that there might be a bug in the code. Can you take a screen shot of a situation where it fails? I’ve not found any bugs in my testing, but if you could show me where things go wrong I might be able to fix it. As you can see, some quads that should merge do not. Ah, I see what’s going on. It is merging faces without regard to the normal direction. This is actually what it is supposed to do, though the effect is a bit unintuitive. 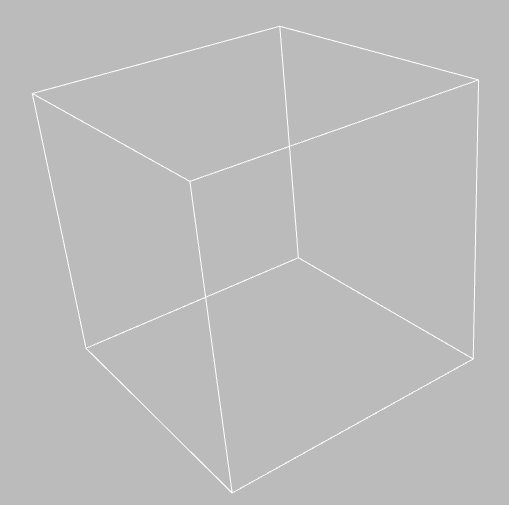 If you look at the other side of that cube, you’ll see that it shares a common face with the one facing toward the camera from this perspective. A good example of this type of behavior is in the `checker’ test case, where the greedy implementation merges all the quads along each strip, even though their orientations are different. For the moment, I’d consider this intended behavior, but if you wanted to fix it, the way to go would be to group quads into different types depending on their normals. Considering that many GPUs internally remap quads to triangle pairs anyway, wouldn’t it be preferable to skip straight to Delaunay triangulation? The most standard way to do polygon triangulation is to perform a monotone subdivision of the volume, then triangulate that. Unfortunately, this would end up being slower than the method in the article; but perhaps the meshes would be small enough that you still gain some advantage. Unfortunately, polygon triangulation can be quite difficult. For example, the only known O(n) algorithm for triangulating a simple polygon is due to Chazelle — and it is so complicated that it has never been successfully implemented! (This fact is a long standing joke amongst computational geometers.) For a general polygon with holes, it is also known that you can’t do any faster than Omega(n log(n)). But then again, these polygons we are dealing with are not general simple polygons, and I would not be surprised if there are much simpler ways to do things in the case of Minecraft. It is certainly something interesting to think about. How could I add some smoothness to the mesh, other than tessellating the mesh after the generation? I’m aiming for something like smoothly curved mountain ladders, but perhaps this is a much more difficult problem to solve. I am glad you asked this question! I am currently working on a post describing how to deal with smooth surfaces. I will hopefully have it ready and posted shortly! I may be wrong but shouldn’t the inequality be y <= t <= y + h rather than just h? I’m finding the greedy mesh part a bit hard to follow without some sample code. I haven’t worked with OpenGL / DirectX recently, but if I remember correctly smaller quads are preferable because the lightning is only calculated on the vertices and interpolated between them. Therefore filling everything with one big quad might be a really bad solution even if it reduces the number of vertices. That is why you would only merge two quads if the lighting values at their vertices are the same. The same argument applies to why you wouldn’t merge two quads if they had different textures or other shading parameters. Setup: MacBook Pro 2.4 Ghz Core i5, NVIDIA GeForce GT 330M 256MB. Most likely an issue with three.js’ software renderer. These models are all so small that differences in rendering time should be inconsequential (with the possible exception of the stupid meshers). Well, this brings up an interesting issue then. If the difference isn’t noticeable in practice, is it worth the extra effort? Is there an example where it is noticeable? If you are just going to render a single chunk of maybe 32x32x32 voxels using a silly 2d canvas hack, it honestly doesn’t matter what you do performance wise. 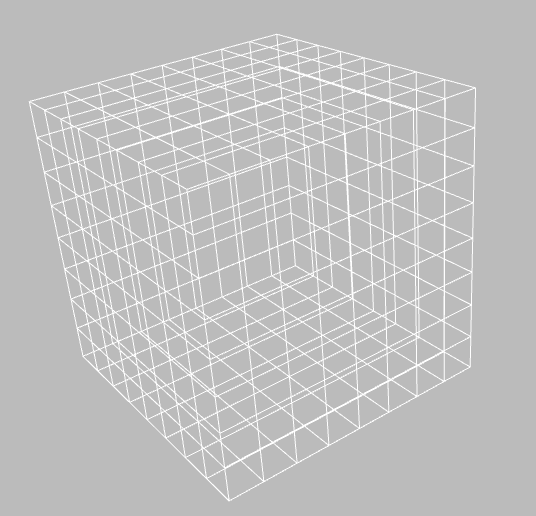 Also I wouldn’t take the small variations in three.js’ canvas based rendering too seriously. That code is probably not well optimized to draw large facets, though on a real GPU this would not be an issue. Anyway, the code on this page is meant to demonstrate the concepts, not provide a complete voxel engine. have you considered using octrees? Also I have a question how would you go about smooth the textures a bit similar to how cube world looks. Is it just a texture? here is a link to picture. http://wollay.blogspot.com/search?updated-max=2011-06-15T23:28:00-07:00&max-results=7&reverse-paginate=true. Is there also a shader library? Thanks for the awesome work! Great stuff! Late to the party as usual but have a question. In culling mode, you seem to leave many identical vertices, is there a reason for that? E.g. two visible adjecant blocks share 4 identical vertices which are counted and used separately. Is there any way you can check on the fly if vertex has been defined already, and just use old one for new quad if it has? Or maybe run over all of them afterwards and remove all the doubles and update quads? Or are those duplicate vertices needed to carry different normals or something else? Thanks! I have noticed that Minecraft seems to use advanced meshing, I have seen holes that were not rendered, and they allowed me to see into the mesh, and I have watched the world load when I am moving faster than the world generator and mesher can keep up. I noticed that entities, torches, Xycraft quartz crystals (which are everywhere), lava (which may have it’s own mesher) etc are rendered weather you should be able to see them or not, along with some of the block faces that are adjacent to them. Such blocks are probably exempt because they are animated, so large amounts of entities and machines can and will impact the FPS minecraft runs at, and it explains why certain mods (like Xycraft) seem to have such a large impact on FPS. Quartz crystals are animated all the time, and they are scattered randomly throughout the chunk in areas not filled with air, they are basically the checkerboard pattern that is impossible to optimize, unless the mesher is told to cull any entities that are not in sight without preventing them from operating. Entities pose a serious problem for any mesher more complex than the stupid one. 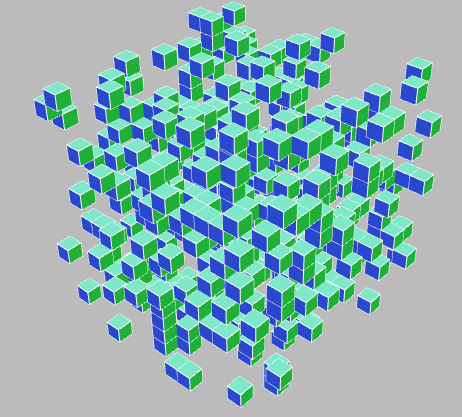 A potentially viable method for storing chunks as a 3d mesh that would handle entities fairly well would basically store the world as two or more layers, each layer would be three dimensional, and would be used for a different type of block (where type refers to regular, entity, liquid, etc). All of the layers would occupy the same 3D space, and to improve the resource efficiency of the mesher, each layer would have a priority level, and would be handled in a different way. The reason for three different meshes is to prevent the mesher from having to re-mesh the entire chunk every time you place an entity, or come across a flowing liquid block. The priority system is used to determine how “air” blocks are handled, the non air blocks in each layer can overwrite air blocks in any layer of lower priority. The first layer would contain regular blocks, and all non-regular blocks as air, and then the greedy mesher would be used to simplify the mesh as much as possible so it would take the least amount of memory and GPU power. The second layer would contain liquids and air, where air is all non-liquid blocks, the greedy mesher would do the same thing it did with the regular blocks, except this time the entire mesh would be rendered if any part of it was in sight to prevent the computer from re-meshing that part of the chunk every time a new block came into sight. Also, most pools of liquid blocks are fairly easy to render because they are often times a flat surfaces. 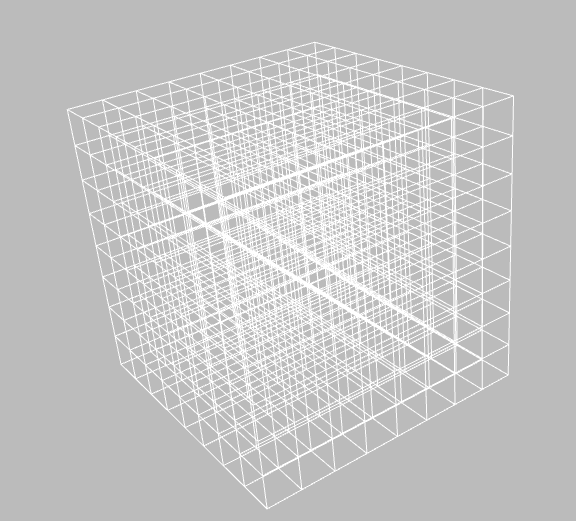 The third layer would contain entities, and it wouldn’t even try to simplify the mesh, it would simply store each entity as an (x,y,z) co-ordinate triple. it would decide weather or not each entity would be rendered based if the entity had regular blocks between it and the camera. all of the entities would be active (but not necessarily rendered) while the chunk is loaded. The stupid mesher would handle any recent modifications to each layer while the chunk is being watched, the greedy mesher would be used while the chunk is not being watched, or if it hasn’t undergone any modifications for a set period of time. The meshers would not attempt to keep up with the entity modifications, those would be done using unique data values and co-ordinate triples because many entities can spawn massive amounts of mini-entities/particles, and several entities can occupy the same space as other entities, and mobile entities require far more precise location data that would greatly degrade the speed and efficency of the meshers if they tried to deal with it. 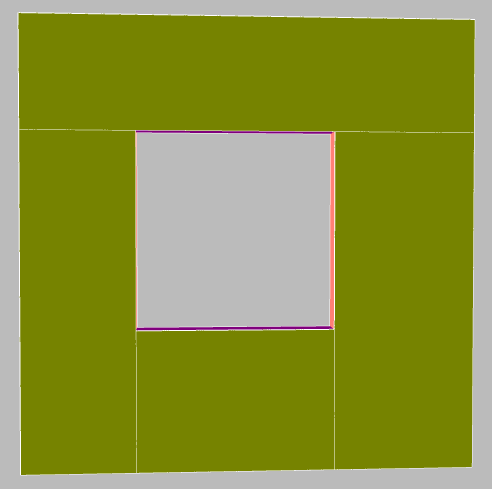 LOD 0: Use a very weak optimisation which only joins 2 rectangles which share an edge. LOD 1: Cull stuff which is not visible (any angle) from the outside. 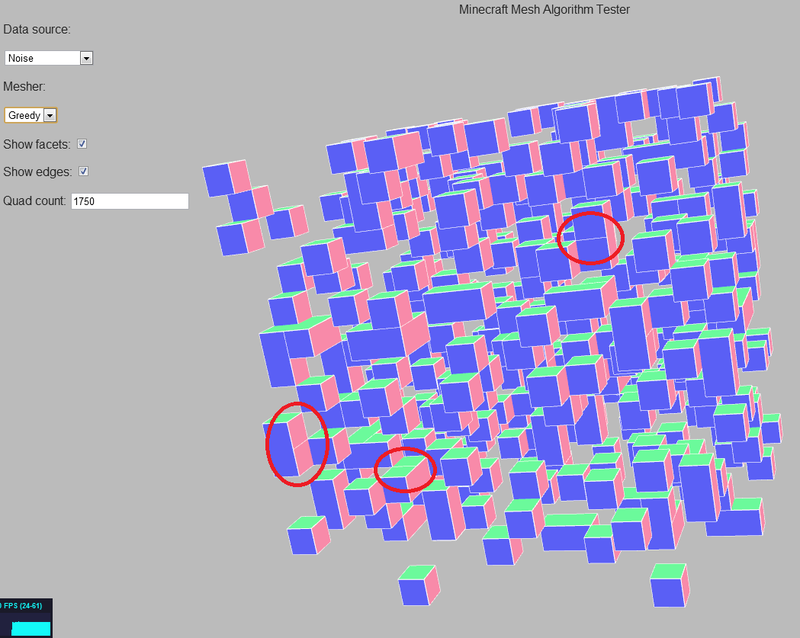 LOD 2: Cull stuff which relys on vision through areas which are hidden by neighbouring chunks. I’d love to see this in action (chunks maybe 16^3). NOTE: The one thing I jet don’t understand are the rendering steps required for various textures, lighting, reflection, …, but 0/1 block exists is sufficient to understand meshing I think. Hi, I’ve ported your code to c++ and got it working. But how do I count the number of triangles to be drawn because I have to use this function glDrawArrays(GL_TRIANGLES, 0, numberOfTriangles) ? Is your greedy algorithm free to use in my project if I did commercial? This is really fantastic stuff Mikola. How you suggest knowing the normal direction using the “Culling Method”? hi！Have you read this one? MeshLab still use it today to do general mesh simplification. Crazy late here i know ! but I’ve got to reply. This is an awesome subject and i really appreciate your treatment ! By combining greedy meshing with dynamic texture generation and packing you would completely remove all constrains regarding merge limitation such as texture type and lighting values. Finally, any poorly introduced alpha would in this case require texel level rejection or late pass z writing to maintain proper depth occlusion – severely degrading performance because of it’s effect on the hardware early / Hierarchical z implementation but here the answer is again simple – draw each of the 3 groups of dimensional slices into it’s own separate buffer and combine them yourself. I’m late to the party, but I wanted to mention a possible problem with the greedy algorithm: cracking. See https://s26.postimg.org/f0zc5l3mh/tverts.png – at the locations marked (and many others) it forms t-vertices. If not corrected, by adding the vertices from one quad to its neighbors, you can get problems with some rendering algorithms. See https://en.wikipedia.org/wiki/T-vertices (which could really be longer). I’m actually surprised I don’t see any t-vertex problems zooming in using your demo – maybe GPUs’ precision really is improving. Or maybe having everything aligned on a grid helps. Have you noticed any cracking? Can’t you simply explain how to get greedy mesh starting from the culled method ? I mean initially we have a bunch of identical quads. How do you merge them ? Your explanation is all focused on total ordering of quads. What for ? Can’t you explain the relation between the algorithm, total ordering thing ? You give us no clue about the algorithm. And sorry but the sample code is literally incomprehensible & ugly. What that really means is if you scanned across your voxel field from the top right looking for switched on voxels and then making the tallest quad from that point down and then extending that to the widest quad it can be, you would be effectively generating the quad list he defines as his total order. I have implemented the interior culling and the greedy mesh algorithm in a project made with Unity.